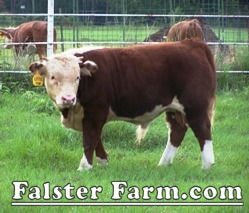 There is an issue forestalling the registration of our 2018 Mini Hereford calf crop: Mark Hanna, owner of the “Neal Trask” polled Hereford Bull we leased from him under contract and insured for $5,000 has reneged on registering the animal with the American Hereford Association until a dispute between another individual is settled, therefore, while our mini Hereford calves hold much promise, the registration has not happened, and may not happen. It is a matter of integrity, and frankly, I will not yield or compromise my integrity. To see if the calf is registered(able) just look at the name line extension. Powerfully muscled on grass alone, the top photo displays his yearling and the bottom mid 2018 photos. Calved 2/1/2010, unassisted, he is an Embryo Transplant held back from an order that went to Belgium in that same year. Disposition is good, very approachable, very well balanced in front and back very wide and sturdy. Measures 49″ at the hip. His average offspring is in the 40# range, KNF JUMPING JACK FLASH being 30#. 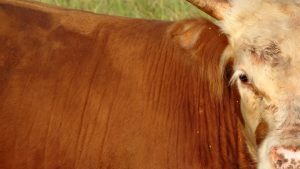 He has a number of heifers sold for $5,000 and bull calves at $5,500. Jack is a true son of PRINCE RUPERT, calved on April 20, 2016. He has seen service covering 5 cows on lease Spring of 2018. He is 38″ tall at the hip and should top out as his sire: well balanced and about 1100#. Very approachable, high show quality. Dam is KNF CHINA DOLL 1863, a line we have had for 18 years. For Sale – $5,000, or Live Cover @$250 per head. Calved July 7, 2016, current on lease to Texarkana on 9 cows. He is a near twin of JUMPING JACK. Dam is KNF 4JFLYER a line we have had for 18 years. Many of his relatives populate No. Florida through purchases from two farms. 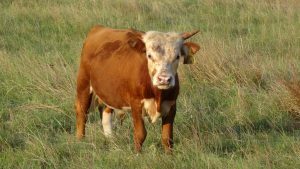 They are wonderfully built, long lived, easy fleshing and docile. For Sale $5,000, or Live Cover @$250 per head. 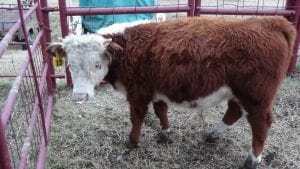 Calved April 17, 2017, to KNF MISS ENID, this youngster is owned by a Swiss couple as investment. 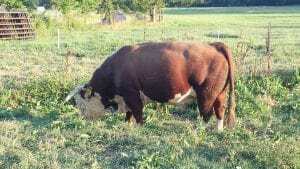 He is a gem, standing 36″ tall at the hip as a yearling., weighing 370#. Photo at right depicts the high value of his tenderness, with lines all the way back into his barrel.